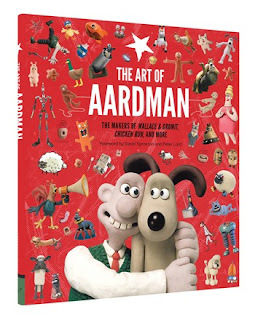 The Art of Aardman is a really fun book that I am really happy to review. It has tons of production artwork and loads of behind the scenes sculptures and set pieces that have tons of character and detail. My favorite chapter is "An eye for every detail", which shows the amazing detail they put into every environment. Each prop and accessories tells a story and the amount or research they do to make those things have so much character and believability is astounding and makes the films have much more depth and enhances the story telling. The only thing I wish is that it had a lot more pages because I wanted more. I do understand that not to long ago the Aardman Studios actually burned down so maybe what we have here in this book is all that was left to show, who knows... Here's hoping they make an " Art of Early Man" Aardman's next stop motion film due out next year which look awesome.